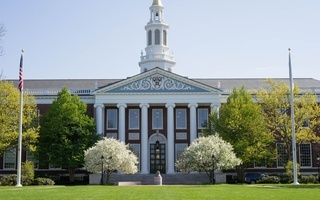 Harvard School of Public Health Dean Michelle A. Williams plans to use the added cash raised through the school's capital campaign to bolster financial aid programs, renovate old campus buildings, and erect new ones, she said in an interview Wednesday. The school announced its capital campaign fundraising total of $933 million two weeks ago. Williams said she wants to invest some of the school’s newfound riches in major infrastructure projects that will help consolidate and update its campus. “A major priority emerging after the successful campaign has to be a campaign to help us rebuild our campus,” she said. Williams pointed to two aspects of the school’s current campus that she finds troublesome. First, the school’s offices and classrooms are dispersed across 25 different physical addresses. 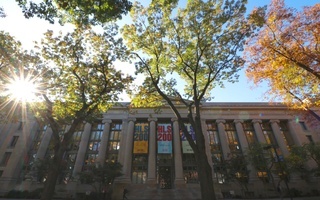 The school’s main campus is on Huntington Ave., near the Medical School, but it also has offices at the Landmark Center in Boston, about a mile away, and in Harvard Square, about three miles away. “It's really hard to exercise this team science if the overhead of our getting together to be a team is so high,” Williams said. Second, she noted some of the school’s buildings are approaching the end of their “built utility.” She pointed to the Kresge Building, completed in 1975, as one example. “We are investing quite a lot in repairing and rehabbing space that we would rather use those resources to build a facility that is more in keeping with the 21st-century science that our faculty and students are doing,” Williams said. Looking forward, Williams said she has discussed plans for infrastructure redevelopment with top Harvard administrators. 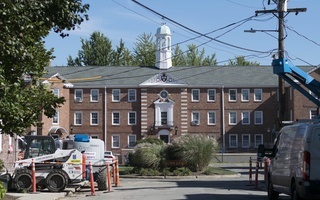 Further construction or renovations would need to be “done in coordination with the master plan of the University” over the course of several years, she said. In recent years, Harvard’s Cambridge campus has seen several large-scale construction or renovation projects — including the more-than-$1-billion House Renewal projects currently underway. Construction, however, has been less extensive across the river in Longwood. Williams said another fiscal priority for the school is to help reduce the debt load that students must assume to graduate. A debt-free guarantee would require the school to spend roughly $40 million on financial aid each year, according to Williams. The school’s capital campaign raised about $26 million specifically earmarked for financial aid, administrators announced at the campaign celebration last month. Full-time tuition without financial aid for the school’s most popular degree program, the Master of Public Health, currently clocks in at $58,635 per year.